Last glimpse of the "morning star." 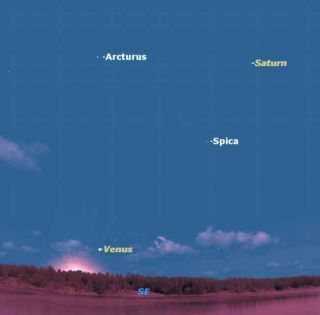 If you get up before the sun this week, you will get yourlast chance for a while to see Venus as a "morning star." Sometimes things in the sky happen very slowly, so that wearen't aware of them. Venus has been a "morning star" since March 27,when it passed between the Earth and the sun. It reached maximum brilliance onApril 30, and reached greatest elongation west ? its greatest distance from thesun in the sky ? on June 5. Since then it has been slowly fading in brightnessand sinking lower in the morning sky, so slowly that you probably haven'tnoticed. If you haven't been up before sunrise recently, you will besurprised at how close Venusis to the horizon as the sun rises, and within the next week or two it willbecome too close to the sun to be observed. It will be at superior conjunction,right behind the sun, on Jan. 12, 2010. It will reemerge from behind the sun inMarch as an "evening star." Venus is popularly known as an "evening star" ora "morning star" even though it is not a star, but a planet. Thisterminology is a holdover from the days when all the planets were regarded as"moving stars" before their true nature as bodies orbiting the sunwas known. Because Venus' orbit is closer to the sun than the Earth's,it goes through phases just like our moon, though you need a small telescope tosee them. At present, because Venus is on the far side of the sun with respectto the Earth, it appears very close to the full phase, since the side of Venusfacing us is fully illuminated by the sun. After it passes superior conjunctionon Jan. 12 it will begin to shrink in phase, reaching the "halfVenus" phase on Aug. 18 next year. This is also the date on which it isfarthest east of the sun in the sky. Between Aug. 18 and Oct. 29 2009, it will be a waningcrescent, at the same time becoming much larger in apparent size as gets closerto Earth and then passes between Earth and the sun on the 29th.